Of all the reasons a cat or dog requires a visit to the Veterinary Surgery, an ear problem is among the most common. Their deep, curved ear canals make it difficult for air to get in and moisture to get out and moisture retained in the ear after swimming or bathing can often lead to infections. Spring and summer when it is hot and particularly when it is humid is the worst time of the year for ear infections. Not only are ear infections likely to occur but quite often they are difficult to cure. Bacterial infections, fungal infections, ear mites and foreign bodies such as grass seeds are the most common causes of ear infections. It is important to know what early signs might indicate an infection so treatment can be started. If your dog or cat is showing any of these signs then a visit to the veterinarian is necessary, as there is a high likelihood an ear problem is present. The best way to prevent ear problems is to establish a regular ear care program aimed at preventing such problems from developing. Keep ears dry. Ears should be dried thoroughly after bathing or swimming. Cleaning. A regular ear clean following your dog’s bath using an alcohol-based ear cleaning solution such as Epi-Otic or Bayer Ear Cleaning solution will remove any dirt or wax buildup that may encourage infections. All of these cleaners are readily available over the counter at the surgery without consultation. Clipping/Plucking. It is important to clip or pluck the hair from around the ear canal. Dogs that do not shed hair such as Poodles, Schnauzers, Bichons, Labradoodles, Spoodles etc. often need to have hair plucked from the canals. This allows better air flow into the canal and prevents wax from being trapped thus reducing the chance an infection will develop. Controlling skin disease. Many ear infections are simply a continuation of a generalized skin condition such as bacterial or fungal infection. When this happens it is impossible to treat the ear infection without controlling the skin disease. What should you do if your Pet has eaten or been bitten by a Bat or Flying fox? 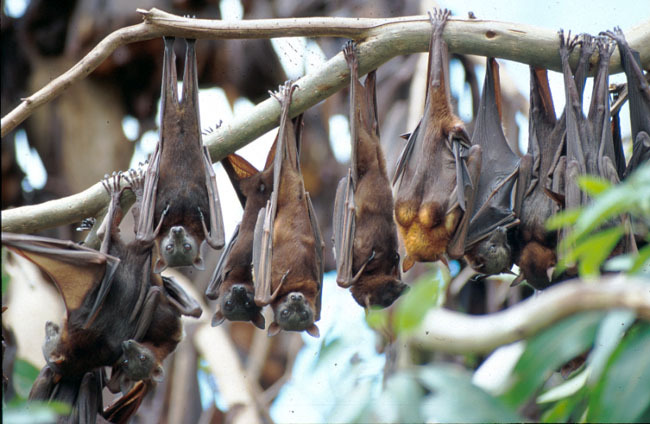 Immediately call us on 07 33571588, there is a specific protocol in place to handle dogs or cats that have had potential contact with a bat or Flying fox infected with Lyssavirus. Should I try and move the bat from the pet? AT NO TIME SHOULD YOU ATTEMPT TO HANDLE A LIVING BAT. IF YOU’RE NOT SURE DON’T TOUCH IT. Even if the bat is dead I would advise against any direct contact. What Should I do if I think I might have been bitten or scratched? What can happen if I don’t get treatment or post-exposure vaccination for my Pet? Maybe nothing – if the bat wasn’t carrying Australian Bat Lyssavirus. The risk of infection is low. but the result of infection could be death, that’s a big risk! You can call us and ask to speak to Dr Ben Charlton, to further clarify all of the points discussed above, the Queensland government has a protocol in place we follow to provide the correct treatment for these patients.